Pokemon with different Types are always interesting to see, especially with how the different interactions of these Types affects different match-ups in the game. In the TCG, though, this rarely gets fully translated over, and often times it’s just one Type or the other. Skuntank, normally a Poison/Dark Pokemon, is a Dark Stage 1 Pokemon, 120 HP, with a Fighting Weakness, a Psychic Resistance, and a Retreat Cost of 3…why 3? I dunno, I didn’t realize he was FAT. His first attack, Sticky Smokescreen, is a 2-for-50 that has the original Smokescreen effect of forcing your opponent to flip a coin, in this case doubled to two coins, and if any result is Tails, the attack does nothing. Hammer In is the other attack, which is a 3-for-100 vanilla beat move. It feels like the main appeal of this iteration was Sticky Smokescreen, which to its credit is overall more effective than the regular Smokescreen effect, as it gives the opponent only a 25% chance of succeeding with their attack. 50 damage on top of that isn’t anything to laugh at either, as an extra boost in damage can bring a Pokemon into KO-range of Hammer In fairly easily. Without a proper Switch out to remove the effect, Sticky Smokescreen could provide a decent barrier to keep an opponent from attacking. That being said, committing to Skuntank means you’re making room for it instead of a couple of other cards that might be something you run in the deck as well, and usually you don’t want to be capitalizing on defensive options especially with an aggressive Type like Dark tends to be. Hammer In isn’t that great of a move at its cost, and while Sticky Smokescreen could stop one Pokemon from attacking, depending on if it gets KO’d or more than likely is Switched around by some means, it won’t stop another from quickly defeating Skuntank, who will need to have a Switch on his side given his Retreat Cost is so high. Skuntank isn’t that amazing of a Pokemon in the grand scheme of things, though he does have a bit of interesting playability in his moveset to be able to do something most other Stage 1s can’t, so that’s something to potentially keep an eye on. Arora Notealus: I know by sheer mechanics, the TCG only lets Dark-Types resist Psychic, but all things considered, they should be immune to them. Granted, having that level of immunity is no doubt ridiculous and can be an auto-loss for some decks, but considering how little Resistance actually does in the game, it might be worth it to start looking into ways to capitalize on the immunity system. I mean, Flying Colorless Types resist Fighting right now, but they’re technically immune to Ground in the games, just like Ground is immune to Electric but not all Fighting-Types are Ground…it’s just very confusing to deal with these interactions, so maybe it’s for the best that they only work in this particular way. Side Review: Kommo-o – all things considered, War Cry still seems like the move to build Kommo-o around, but the practicality of a Stage 2 line-up means it can’t be splashed into just any deck. It would be nice to see that work out, but in the meantime, it’s probably for the best to try and make it work in favor of this one move. 2-for-120 is a solid strike if you play your cards right, and it can be an aggressive push back against a couple of different decks. 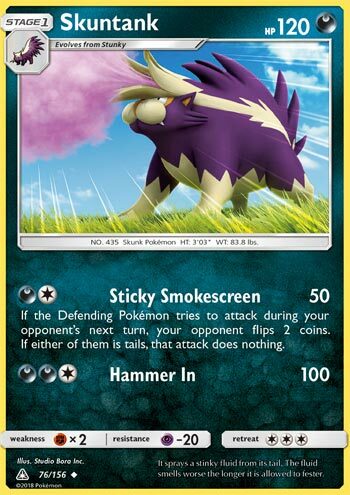 Skuntank (UP 76) stinks its way into the meta from the Ultra Prism expansion set. This Stage 1 Dark Pokemon has two attacks. Hammer In, for two Dark and a Colorless, does 100 damage, but its feature attack is Sticky Smokescreen. Sticky Smokescreen does only fifty damage, but unless your opponent flips two heads when they go to attack in the next turn, the attack does nothing. MarquisEXB came up with a good disruption deck featuring Skuntank and Baby Zoroark which he detailed out here. It’s a budget build, so it’s got some inherent limitations, but it definitely has some potential for stalling. Between the energy denial and Sticky Smokescreen, that should give you time to get the Zoroark Breaks set up. That’s the theory anyway. I went 1 W 4 L with this list, but I know Marquis had more success than I did with it. Skuntank is the first card we’re reviewing in this week that probably could have been called “Disruption Week” where we’ll be looking at some of the best mill / stall / disruption cards coming out of UP. Skuntank may not be the best mill card from the set, but it does have some potential. It also serves as a good reminder as to why Pokemon cards aren’t scratch and sniff.